WASHINGTON, DC, November 15, 2013 (ENS) – The average American produces 4.4 pounds of trash a day, and as a whole the United States produces more than 250 million tons of trash a year. Yet more of that trash is recycled each year. The national recycling rate has increased every year for the past 30 years to the current recycling rate of 34.7 percent, according to the U.S. Environmental Protection Agency. Today is America Recycles Day and many organizations are planning to recycle more and encourage all Americans to join them. “Recycling not only reduces pollution, but also saves energy, preserves valuable raw materials, and reduces emissions of greenhouse gases that contribute to climate change. In addition, it spurs economic growth, generating billions of dollars each year and supporting local manufacturers who depend on recycled materials to make their products,” said Obama. “America Recycles Day offers an opportunity for each of us to reflect on the ways our habits shape the world around us. 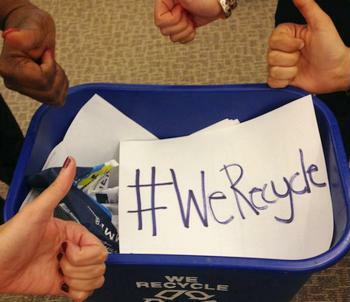 In our homes, offices, and schools, let us strive to make recycling a part of our daily lives. We should reuse or donate when possible, and recycle or compost as much as we are able. Students can get involved by championing waste-free lunches, recycling programs, and collection drives to repurpose resources like used shoes, water bottles, and digital cameras,” the President said. The Ad Council and Keep America Beautiful are partnering with online grocer, FreshDirect, to feature messaging from their national “I Want to Be Recycled” public service advertising campaign on all FreshDirect delivery boxes. Beginning now and continuing all year, the new FreshDirect cardboard delivery boxes will be delivered in the greater New York, New Jersey, Connecticut and Delaware metro areas, and Philadelphia. The boxes include the line, “I want to be a cereal box. Recycle Me.” They direct customers to visit IWantToBeRecycled.org, where they can access a localized search tool to find curbside locations or recycling centers in their area and receive more information on how and what to recycle. But not everyone is recycling more each year. A new report from the Container Recycling Institute shows that sales of disposable beverage containers have increased over the past 10 years, while recycling rates have stagnated. Based on more than two dozen data sources, from the beverage market to U.S. census tables, the report shows that sales of disposable beverage containers grew by 22 percent from 2000-2010, with per capita consumption up by eight percent over the same period. A live counter on the CRI website show the number of beverage cans and bottles that have been landfilled, littered and incinerated in the United States so far this year surpasses 112 billion. On America Recycles Day, the non-alcoholic beverage industry says it is doing more to recycle. “From our 100 percent recyclable packaging to our efforts to minimize waste and support recycling programs, our industry is leading the way and doing our part to reduce our environmental impact,” said Susan Neely, American Beverage Association president and CEO. In Massachusetts, for instance, the beverage industry is working with communities through the Massachusetts Recycling Challenge to provide technical assistance to implement a Pay-As-You-Throw, PAYT, waste system. PAYT provides an immediate incentive to households that reduce trash and increase recycling by charging residents a fee for each unit of waste they discard, instead of a fixed fee per household. Obsolete electronics are the target of a recycling effort by the national environmental advocacy organization Rock the Earth. Rock the Earth will partner with AEG Live Rocky Mountains to collect and recycle old cell phones at every show at the Ogden Theatre, Bluebird Theater, and Gothic Theatre in Denver, Colorado. The drive kicks off on America Recycles Day. Starting today, people can stop by the Ogden Theatre, Bluebird Theater and Gothic Theatre box offices between noon and 6 pm or while attending any concert, to drop off their old, unwanted phones. They will be entered into a monthly contest to win a pair of tickets to a concert of the winners’ choice. Rock the Earth and AEG Live Rocky Mountains decided collaborate on a cell phone recycling drive because every year 100 million cell mobile phone become obsolete. One billion new mobile phones were issued last year in the United States alone, yet less than 10 percent ever get recycled. The wireless carrier Sprint leads the industry in phone recycling. Last year, Sprint reclaimed 4.4 million phones through voluntary collection programs compared to AT&T’s 3.1 million and Verizon’s 3 million. On America Recycles Day, Sprint will offer customers a minimum account credit of $20 for any phone traded in, in any condition, regardless of carrier, in select Sprint stores in San Antonio, Houston, Los Angeles and New York. Hundreds of other recycling events and activities are happening across the country today in schools, businesses, government agencies and nongovernmental organizations. Find out more at the America Recycles Day website.